Love how he looks like he is shaking the water off. Really cute card. Love this crazy dog! What an inspired way to use the challenge colours. What a cheeky looking playful pup! Perfect for a cute birthday card! Just adorable...love your sweet puppy! I think this dog was thrown in the water and NOT happy about it, LOL! I love how you made the water splatters! Fabulous card. 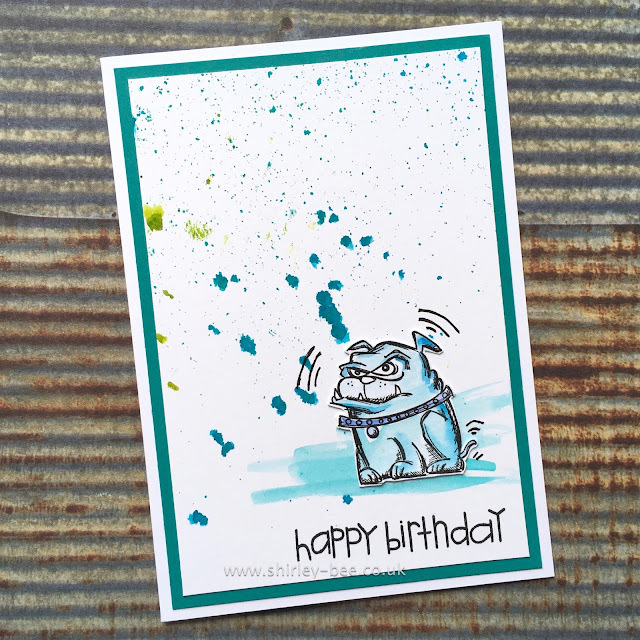 Yes, or he was playing in your paints again...LOL Great card Shirley! Amazing! you are right your strategically placed splatters give the impression he has shaken off those beautiful vibrant colors! Bravo!! Ha, your dog does look like he's shaking! Love those crazy dogs! This is so fun! Great background and hilarious - definitely looks like he is shaking off. So clever!